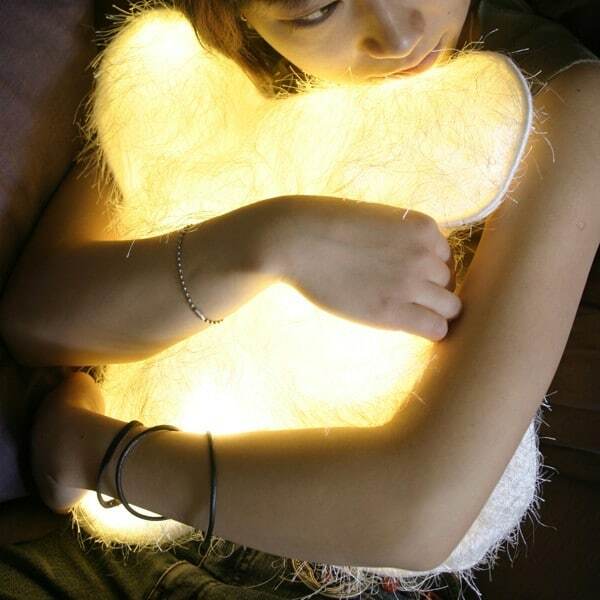 At the International Contemporary Furniture Fair, designer Diana Lin said the concept of d*light Huggable was to “provide companionship to those in need of comfort.” Literally, a huggable light. Light to the rescue! This pillow is filled with warm white LEDs in bubbles of silicone, which create a diffuse, comforting light which connotes sunlight. The silicone absorbs body heat for extra huggability (that’s a technical term!). The cushion stays lit for 4 hours off of rechargeable AA batteries before slowly dimming, or all night (or cloudy day–take that seasonal affective disorder) with 5v AC adaptor. Sounds like a perfect thing to pair with a good book! Now does anyone know a way light can hug me back?